This breakfast makes leftovers the star. 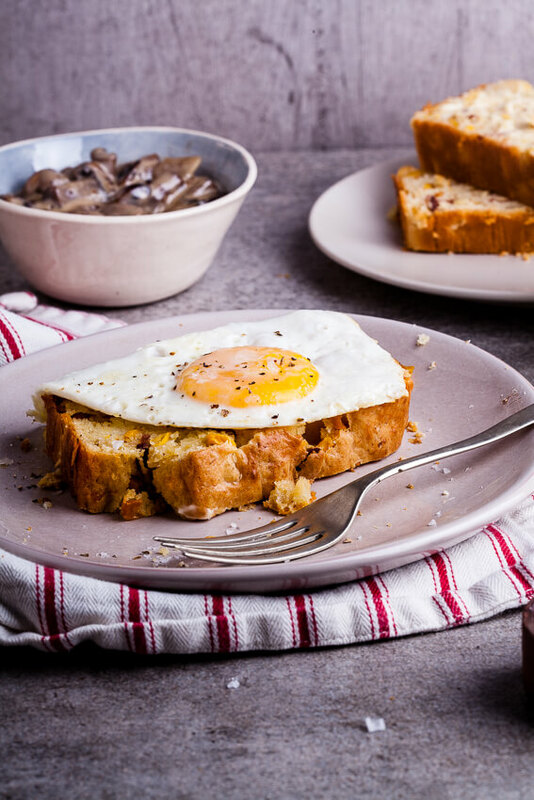 Top a slice of toasted, bacon corn bread with a perfectly fried egg and creamy mushrooms for the best breakfast. Man, public holidays are lovely but they throw me off big time. It feels like Monday right now but also kind of like the first day back from an actual holiday because we have had non-stop public holidays for a while now. And getting back into the swing of things also takes me a while. Especially since I feel like I haven’t actually gotten into 2016 at all yet and we’re already heading into April. How, even? Does anyone else feel like 2016 has just been a whirlwind of b!tch slaps and craziness? Because that’s exactly how it’s been for me. So I’m taking today to ease myself back into normality with some comfort food and chilled out music. The comfort food in question is the bacon corn bread I shared with you a few weeks ago turned into what is probably the most scrumptious breakfast, like, ever. 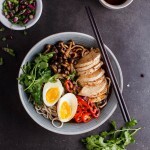 Topped with a perfectly fried egg (that egg yolk though!) and creamier than creamy mushrooms, this is the kind of food dreams are made of. Especially when served as a lazy weekend breakfast. Now, I know. 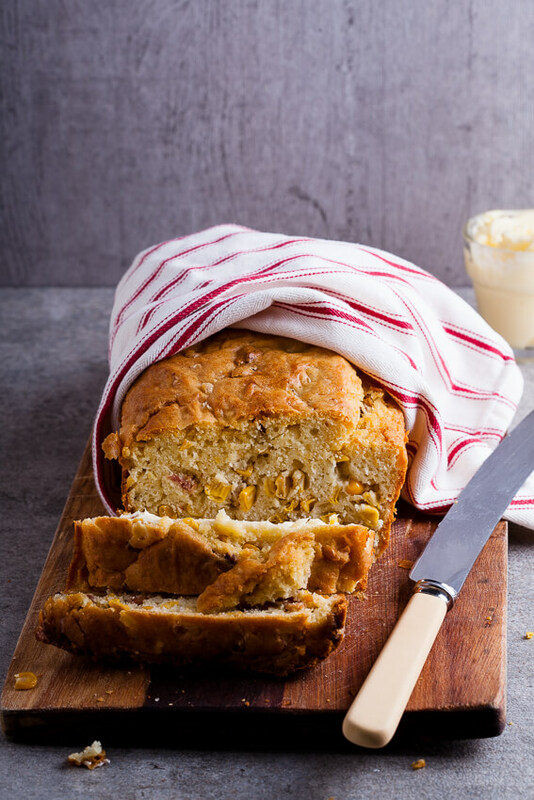 We’re still a few days away but I’m giving you ample time to bake this loaf and use the leftovers for breakfast this weekend. 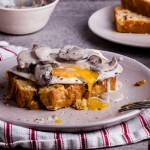 I’m pretty sure this would pretty phenomenal topped with hollandaise sauce to create a very loose version of Eggs Benedict but the creamy mushrooms add something a bit heartier to this recipe. 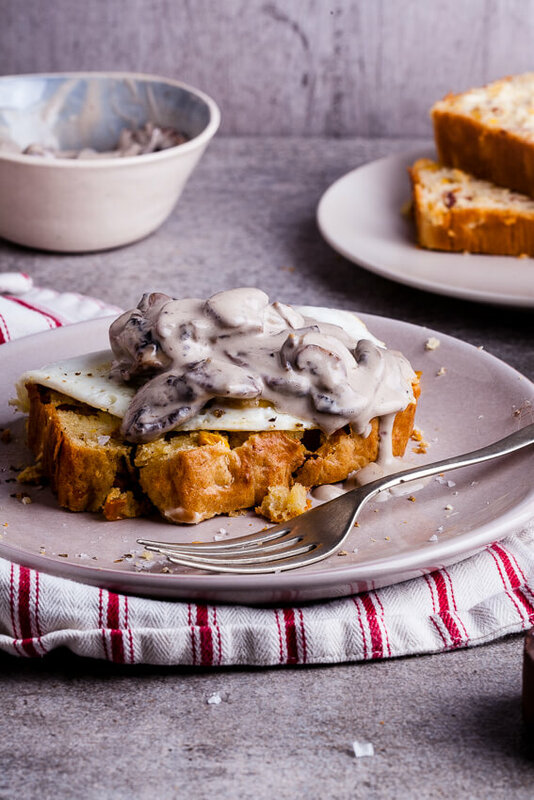 Plus, who can resist creamy mushrooms, right? I love that this takes all of 15 minutes from start to finish and you’re left with a pretty impressive, drop-dead-delicious breakfast. Or lunch/dinner. No judgies. To make the mushrooms, heat the olive oil and butter in a pan over medium heat then add the mushrooms. Fry until golden then add the garlic and sauté for another minute or two. Add the cream and allow to simmer and thicken for a few minutes then season with lemon, salt and pepper. 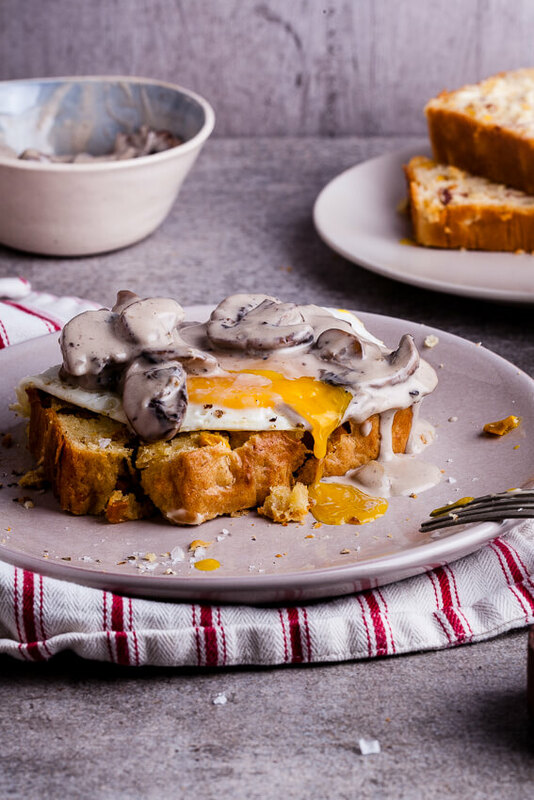 To serve, top the toasted bacon corn bread with a fried egg and a generous spoonful of creamy mushrooms. 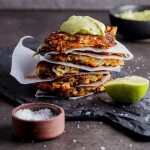 What an interestingly different recipe. Definitely a must try! Your photography are so beautiful.